NanoJapan provides a unique opportunity to young undergraduates to study electronic nanomaterials as well as experience a different culture. Personally, I feel participating in NanoJapan will strengthen my character, independence, and broaden my appreciation for research. I will also be able to collaborate with established scientists/engineers and develop friendships with my Japanese/fellow NanoJapan peers. In addition to social benefits, this program lays a strong foundation for my undergraduate career in regards to academics, research, and personal skills. The program may expose me to new fields that may interest me in the future, perhaps graduate studies. NanoJapan does this by fostering S.T.E.M. interests in undergraduates through supporting the international exchange of ideas and novel perspectives. This summer I am looking forward to diving into a culture in which I have no prior language experience. I am so excited to embrace everything this program has to offer; especially being able to be immersed in a culture that has fascinated me for so long. In terms of research, nanotechnology has an abundance of potential. It is an honor to be able to work in such a cutting-edge field with established, international scientists and engineers. I look forward to exploring all that nanotechnology and Japan has to offer. It undeniably will be an unforgettable experience. Narrow my interests in electronics and/or materials to get a better idea for future studies. 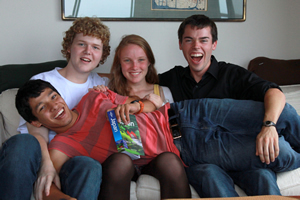 Make international friendships and broaden my understanding of an unfamiliar culture. Become a proficient speaker and reader in Japanese. Develop an understanding/appreciation for international/interdisciplinary scientific collaboration. I was very surprised to find Tokyo to be extremely clean, orderly, and safe. As one of the biggest cities in the world, I expected Tokyo to be an urban jungle. I quickly became comfortable walking around the streets and taking the metro at any time of day. For example, the metros are impeccably clean, despite the fact trash cans are no where to be found. Even behavior and interactions in the train cars are orderly, quiet, and to themselves. 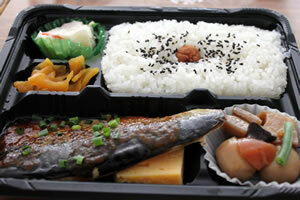 This week, lunch after language classes was usually a bento box. I really enjoyed meeting the Japanese students during the the KIPP evening discussion program!!! There was a range of topics we discussed pertaining to communication. I had so many great conversations! One of my favorites was with Mimi-san. She said foreign language, Spanish and English, gave her an outlet to interact with people in a different manner. She discussed being intrigued by how different aspects of her personality prevailed while speaking different languages. We found that we have very similar philosophies about language and the importance of foreign language study. Despite being from different cultures, it was great hearing that we shared the same values and interests. One of my conversations, with Teppei-san, discussed what I thought about marriage. At first I was a little surprised by such a question. But I found myself interested in how he reacted. I said that I wasn’t interested in getting married and hadn’t really thought about it in detail. He was so surprised and could not understand how the thought didn’t cross my mind. He seemed to think everyone had plans to get married. He said my thoughts were similar to the KIP student body president’s ideas. Interestingly enough, she lived in the states for half of her life. I am interested in learning more about the Japanese stance on marriage and women’s ideas/values in Japan. 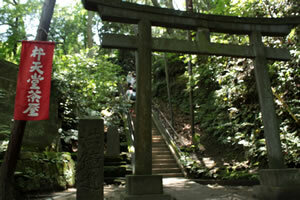 A gate near the Engakuji Temple in Kamakura. In our free time, Lila, Xavier, JJ, Jordan and I met up with Mimi-san in Asakusa. We were in the area looking at the Sensoji shrine and a surrounding festival and later got lunch with Mimi-san. She introduced us to Monjayaki. We learned a few table manners from her, things that I never would have even considered! Near the beach in Kamakura after lunch at a local burger shop. General rules such as no eating, talking on the cell phone, and making eye contact are recommended in American public transportation. However often they are not always followed in the United States, and officials do not really mind enough to enforce these rules. In the United States, there are no initiatives for women in public transport, such as a “women’s only” train car in the Tokyo metro. Also, Japanese transport is so much more efficient than American methods and is incredibly reliable. I have always seen trains come at exactly the scheduled time. Public transport in the United States is very loud, often unsafe, and littered with trash. I definitely never thought public transportation could be so organized, efficient, and respectful! I learned that “respect” to the Japanese extends far past interpersonal relationships. There are many details, subtle behaviors that demonstrate respect, beyond the scope of many conscious efforts. Japanese respect permeates in manners that, from my perspective, take quite some level of interpretation. I think that coming to terms with these subtleties, has benefited me positively. It has demonstrated to me that a careful eye for detail is required to understand the core intricacies of Japanese culture. I think that public transportation demonstrates some core Japanese values that we discussed in pre-orientation, especially harmony and pack-mentality. The efficiency and fairness of public transport rests on the collective effort to uphold these core values. For example the quietness and cleanliness is a way to preserve harmony through silence. Contrary to other large metros, such as the New York or Paris metros, passengers make careful queues while waiting for the train. It demonstrates a Japanese value for respect and maintaining harmony. It is respectful to each passenger on the train to uphold these standard. If one person fails to uphold these standards, it is disrespectful to all parties. I am very excited to be able to begin doing research! There are so many exciting aspects of my project. I just want to get results as soon as possible. I am very nervous that I will offend my co-workers, as I am unfamiliar with the culture. I worry that I won’t be able to communicate well with them and therefore make them uncomfortable. Otherwise I am so incredibly honored to have this opportunity. I can’t wait to begin working! KIP and NanoJapan students after eating lunch on a beach our first day at Minami-Sanriku. Upon entering the elementary school for the first time, children were screaming and waving at us. They ran from their classrooms and pressed their faces against our room’s windows saying “Hello, hello, hello!” with huge smiles. What a greeting! I could feel their energy and was shocked by how excited they were. Why in the world are they so happy to see ordinary college students? Packard-sensei said that they are happy to see Americans because Operation Tomodachi (American task force mission) helped rescue people during 3/11. I was not entirely convinced that the children felt the same way. It still kind of confuses me. Despite the reasoning, I was touched by how welcoming they were to us. 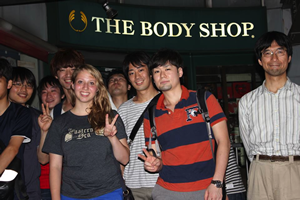 It was the first time complete strangers in Japan have reacted positively to us (the NanoJapan group). We toured Minami-Sanriku and surrounding areas. Destruction was everywhere if you looked closely enough. Swimming in nearby beaches was prohibited as locals considered the water to be sacred. That people are still missing from 3/11 as well as the fact the ocean claimed many souls, require the waters to be considered delicate, sacred, and respected grounds. The quietness and remains of buildings seemed to resonant with me as we toured the area. One area has a building where a woman announced over the radio to evacuate the area. She continued to radio to people in the surrounding areas until the tsunami claimed her own life. Rather than evacuating, she put herself above other people. 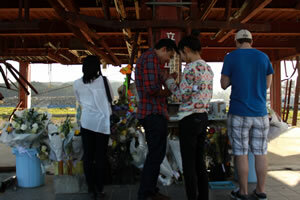 The serious value of human life seemed to permeate the atmosphere everywhere we went. This trip had a profound impact on my outlook, appreciation of culture and simply “being”. 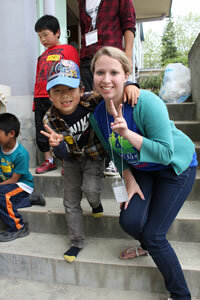 Mittsu-chan and I at the Minami-Sanriku Elementary School after the field day. I think this experienced really impacted me because Mittsu-chan didn’t care that we couldn’t communicate. He was genuinely happy for the NanoJapan students to visit and didn’t hold a negative preconception due to a language barrier. His interactions were genuine. During our time together, I felt very sad for him, knowing that he was probably a young child during 3/11. He could have lost his house, saw pain in his community, maybe even lost family members or friends. Throughout the day, this was always the thought at the back of my mind. This strongly affected me, especially seeing how kind, innocent, and at the same time how equally solemn he seemed to be. I didn’t expect to feel such a resonance with Minami-Sanriku and 3/11. Emotionally I know that the disaster was a horrible event. However, once I visited and spoke with locals who experienced 3/11, I felt a personal connection to the disaster. As locals opened up to us, welcomed simply our presence, expected nothing in return for hosting us, and willingly shared painful experiences with us, I developed a personal connection and thankfulness to the people and area. There aren’t words to describe how much this trip impacted me. Mami-san and Dante lighting incense for Miki Endo, the government worker who sacrificed her life during 3/11 to radio locals to evacuate the area. Ron, Takatoshi-san, and I at a Chinese restaurant in Meguro. In the lab, my mentor is named Kuga Takayoshi. However in the first week Professor Kawano has advised me directly a lot of the time. Kuga-san is very friendly and well liked in the laboratory. He took a lot of initiative to help me with my project before I even arrived in the laboratory. It seems, as though he is one of the only Master’s students present daily in the lab; he is given a lot of responsibility and many people rely on him. My interactions with people in the lab have been a bit limited besides a few of the undergraduates I trained with at SNOMs. This is simply because of the language barrier. However, in this past week I have participated in the dinners and lunches with lab members. I feel connected in this manner and simple things like saying good morning or good night. I mostly interact with graduate and our PhD students because their English is very good. I wish I could connect more with the other students. Despite language barriers, I have found its fun to connect with them socially by card games. We have been swapping Western games for some popular Japanese games. For example lab members have taught me: Buta no shippo (literally pig’s tail), shichi narabe (7’s in a row/7 families), amongst a few others. My housing is different in some ways from my dorm at school. It is very convenient as, although it is a small room, there is a personal bathroom and kitchen. It is very convenient for me and allows me to cook for myself. There are also computer, laundry and public kitchen facilities. The dormitory provides spices, sauces, pots, cooking equipment, rice cookers, everything for cooking! It is so useful as I don’t have to invest in these things for my short stay. In other ways it seems a bit strict. Leaving the dormitory before 7 AM or after 11 PM, or taking a weekend trip requires me to apply at the front desk. I also have to sign-in and sign-out as I come and go from the dorm. If I were to disregard these rules, the dormitory would notify my laboratory and would also reserve the right to refuse me housing. This is quite different from my dormitory in the U.S. where these rules don’t exist. Though, I do not mind so much because signing-in and out is easy and the curfews usually suit my schedule. My dorm at school does not provide all the convenient services provided by my Japanese housing such as cooking equipment, refrigerators, computers, etc. Also, my room itself is fairly Japanese style, from the bedding to the hard wood floors. The most obvious Japanese feature is taking off one’s shoes before stepping on the wooden floor. My research project will investigate the optoelectronic properties of the p-n junction CNT devices through photovoltage measurements in the THz range. This includes power dependences at some wavelengths. Also take I-V without/with illumination sweeping -10 mV to 10 mV, ensuring light beam is absolutely less than 5 mW (probably start a lot lower). Would be very good to see some shift up in the I-V curve in the THz. These curves may be linear, or non-linear, not sure in this range. Take polarization dependences at several wavelengths to show alignment of CNTs and the responses at an angle. Take wavelength dependences to see if broadband response still holds, hopefully it does. The anticipated goals/outcome revolve around demonstrating polarization sensitivity and relatively flat response (.06 mV photoresponse) across wavelengths to show broadband response (consistent with previously studied wavelengths). I will be using the p-n junction CNT photodetector device samples. These consist of p- and n- doped horizontally aligned CNT films overlapped to create a p-n junction. Electrodes contact each film and silver paste is used to secure a gold wire on each. The samples are inside of a pin carrier with two gold wires (one from each electrode) contacting a pin. The sample is held at atmosphere. The measurement system is as follows. There is a voltage source connected to a switch box corresponding to the pins used on the sample. The response of the sample is sent to a current amplifier, connected to a multimeter, and finally to the computer. On the computer, Kawano-sensei has a program already made that measures photoresponse of samples. I will use a THz laser pumped by a CO2 laser and focus its beam at low power (0.5-5mW) on a THz fiber, which points to the center of the p-n junction overlap. This should create a response that I can measure. Polarization measurements should require the use of polarizers (Although the Kawano group does not have any at the moment). These measurements will be taken by hand looking directly at the multimeter (rather than with a computer program). Wavelength tunability will be needed for this project as well (wavelength dependences). This will be achieved by manually changing the wavelength on the CO2 pump grating. Various frequency ranges can be achieved by the use of various liquid chemicals, such as methanol or diflouromethane(CH2F2), in conjunction with the modulator. This modulator can change thus produce frequencies between .5 to 3.1 THz. A very raw example of SNOM’s first harmonic optical scan in an Au sample illuminated with the CO2 laser. This was taken when lab members were trained to use this microscope. The lab has been training with its new Scanning Near-field Optical Microscope (SNOM), a bit like AFM, so it has been quite busy. Due to having the microscope installed, many projects have been postponed for that. I spent my first morning reading papers and going to SNOM trainings in the evenings. I began taking I-V measurements for the project later the first week. The set-up was unbelievably convenient as Kuga-san uses the same optics set up and Kawano-sensei already has a photoresponse program installed on the computer. It seems everything is in order to start taking data. I really only began my project on Friday, when we first took an I-V curve without illumination. The previous few days were SNOM training sessions. The beginning of this week (week 2), we took an illuminated I-V curve. Kuga-san showed me the equipment and computer programs that I would need. I also learned how to use the THz setup. One day I went shopping. As I walked through the doors, shopkeepers would say “Irasshaimase!” multiple times, smiling and bow their heads. At first I was a bit overwhelmed by their welcomes. They were so energetic and attentive that I felt it was awkward if I didn’t acknowledge them. In the United States, most shopkeepers are not welcoming and thus generally customers don’t usually directly acknowledge them upon entering. Perhaps the customer nods at the shopkeeper to be polite and acknowledge them. It’s usually understood the customer is there to accomplish a task: buy an item and leave. Therefore, shopkeepers who go the extra mile generally are well received by customers. In this case, eye contact and a smile, maybe an exchange of a few words is appropriate. In Japan shopkeeper’s enthusiasm in welcoming costumers is nearly mandatory. Because of how I am used to shopping in the United States, I smiled and nodded my head to acknowledge their enthusiasm. Upon doing so the sales attendants would rush over and start looking through items nearby, picking them up and showing them to me, and asking me so many questions in rapid Japanese. I politely told them thank you but I don’t understand Japanese and left the shops soon after to avoid a similar experience. Rather than simply accepting this and leaving me, they stopped and cocked their head a bit confused. I was so overwhelmed as every shop I went to, the same situation happened. On top of the fact I couldn’t proficiently respond to their questions, I couldn’t have a moment alone to ponder items. Shopping soon became such an exhausting and stressful experience. I realized there most be some cultural detail I was missing. I figured my acknowledgement must be calling them. Although at first I felt rude, I began to not acknowledge the shopkeepers to try to avoid catching their attention. I soon found that I could browse independently. When I got back to my dormitory that night, I began searching for Japanese shopping etiquette. I soon discovered that my suspicions were correct. The way I habitually “acknowledge” shopkeepers in the United States is a bit different from in Japan. My nod of acknowledgement is a signal asking for assistance. I was asking for help and not even knowing it! This ignorance became such a stressful experience. I was trying to be polite by acknowledging shopkeeper’s enthusiasm. I habitually did this through a smile and nod, as I would in the United States. Of course I should have realized the implications of a nod in Japanese culture. The shopkeepers of course reacted how they habitually understand Japanese customers. At first I was just very impressed with Japanese retail, when shopkeepers rushed over to help me. I thought the shopkeepers simply had excellent customer service. My ignorance became very obvious to me at the third or fourth shop when the same situation kept occurring. My frustration and their confusion was a clear indicator there was some kind of misunderstanding. As I went to different shops, I was able to adapt and react more appropriately and had a much easier experience. This weekend I went to Kyoto and wanted to share some photos of my trip. 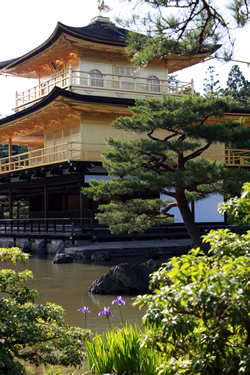 Originally the home of shogun Ashikaga Yoshimitsu, Kinkakuji Temple (Golden Pavilion) is covered in gold leaf. 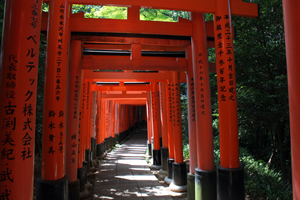 One of the many Torii gate walkways at the Fushimi Inari Shrine in Kyoto. 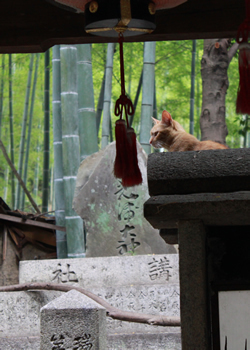 While walking up a quiet path away from the main Torii walkway, we found a small shrine with a cat that seemed to live there. In many Shinto shrines, there are animal guardian statues to protect it. It seemed this cat was the guardian of this shrine. Research Update: Over the past week I have learned how to use the THz laser system and to some degree maneuver around the Japanese software. I have been taking I-V curves with illumination to try to see any change from the non-illuminated. I have also tried to reproduce Xiaowei/Seb’s results in the optical range but so far have had no luck in doing so. I will try to dedicate the day to getting this resolved. My lab partners are very keen on trying different wavelengths in the THz on the sample. However, I feel like our method is kind of a shot-in the dark. We aim a THz fiber at the sample and secure it with a clamp rather than directly focusing the beam on the sample, moving it with a stage. It is difficult to precisely find the junction/max signal in this way. In order to move the fiber, one has to physically pick up and move the clamp to a new location. Xiaowei and you have specifically requested using a stage multiple times. But, my lab partners are so sure about their current set-up (THz fiber aimed at sample’s junction in cryostat at atmosphere). In addition, the sample is in a chip carrier, which is a bit awkward to mount on an optical stage. If I try to suggest changing the set-up to fit the suggested, my peers say the cryostat/fiber is the best the way it is (due to past experience). I’ve been attempting to push for a stage with no fiber (directly focus beam on sample) for the past 2 week. Kuga-san suggests getting more I-Vs at various wavelengths rather than re-evaluate this. In the morning, each lab member says good morning, nodding to every cluster of desks before sitting down. The undergraduates are comparatively formal with their superior graduate students or sensei than American students. If we encounter an issue with a project, often out of respect they don’t ask questions or try to suggest ideas of what the problem could be. But this could be due to their low hierarchical rank. I have discovered that even low-level graduate students usually disregard an undergraduate’s ideas, perhaps due to hierarchy. When exiting elevators, lower ranking students generally wait for graduates to exit. Usually the professor exits the elevator first. Of course this is usually the etiquette in the United States, but it seems to be followed much more strictly in my Japanese laboratory. When people have disagreements, usually hierarchical rank decides who wins the disagreement. For example, often my mentor will tell my lab partner and me what we need to accomplish next. Sometimes I may not agree with what I am told and will ask my lab partner for an explanation. Many times I am told with a bit of nervous laughter and a shrug, “Because he says to do this.” Often if there is a general disagreement of misunderstanding, no one will ask about it. These characteristics of the laboratory exhibit exactly what I was told during orientation. Especially regarding the lack of questions or disagreements. Personally, I have found myself in very inefficient work situations because of this practice. A lot of times I find myself doing tasks, that personally I consider unfruitful, to preserve the level of respect and fit into the hierarchy. Hard work, especially in regards to long hours, teamwork, and hierarchy are extremely valued in Japanese academic research. For example, most of my lab members stay in the laboratory until 10 at night if not later. Many students have inflatable beds. It is not uncommon to enter the next morning with several people sleeping after a night of hard work. In regards to work ethic, my Japanese lab members are much more patient and experience problems on site. In American laboratories that I have worked in there are coffee breaks daily. After troubleshooting an issue and not finding a solution, often people will take a break, scratch their heads, and discuss the issue together. In my Japanese host lab everyone patiently waits to resolve the issue. However, contrarily, the graduate students or even professor are trying to trouble shoot the issue alone. The hierarchy prevents undergraduates from giving input and thus many patiently stand and watch. If by chance an undergraduate lab member unrelated to the project happens to be in the vicinity during troubleshooting, he is also expected to join the group of the watching undergraduate students. I think this is one example of the lab’s values in regards to teamwork and hierarchy. I think the biggest difference from working Japan and the United States is hierarchy and obviously the language barrier. I personally prefer the laid back environment with a less obvious hierarchy. I find it more conducive to learning, as students are more comfortable asking questions. I also feel that a more free exchange of ideas and debate can spark creativity and help realize mistakes early on. In my experience, I feel this system saves time, helps directly form problem-solving skills, and more easily allow one to diagnose holes in their knowledge. Although I prefer the laboratory environment in the United States more, I respect the intricacies of Japanese culture embedded in their daily work. The very first week I arrived the lab received a new tool, a Scanning Near-field Optical Microscope (SNOM). Although only one lab member, a graduate student, is expecting to use it, all undergraduate and graduate students attended the training. A technician from Germany visited to present this training. At first, the number of students attending surprised him. He said to professor Kawano, “You have such good, curious students,” He continued to be surprised as about 7-8 undergraduates and 1 masters student watched him set-up optics and calibrate the machine, eight hours a day and five days in the week. Even when the technician specifically said, “I feel it is unnecessary to watch me do this grunt work. I don’t want to waste your time. Why don’t you come back at 2 PM for training?” students nodded their heads and remained to watch him. There were many moments where our presence was unnecessary. At times, it was obvious the German technician was confused and felt a little awkward by our behavior. What he didn’t realize, and I did thanks to orientation, was the unspoken standard in the lab, to be a team unit. At the end of the training, the technician offered to personally train each student individually. Each individual session lasted about 30-45 minutes. As each student attempted to use the SNOM, all other nine students patiently waited and watched. At first I thought they were trying to ensure they understood every detail by watching their peers use the SNOM. But, as the fifth participant began, everyone was thoroughly familiar with the instrument. Until the fifth, final day of training, all students were present at every SNOM meeting, whether it was beneficial to them or not. Although I was expecting this etiquette due to the NanoJapan Orientation, I was blown away by the magnitude in which this cultural standard was followed. I think this situation exemplifies the unspoken rules regarding teamwork in my laboratory. I went to Ginza this Saturday to find Itoya, a famous stationary shop. 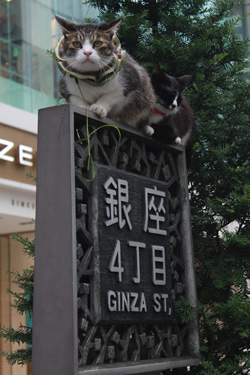 Unfortunately I couldn’t find the store, but I did find a cat being swarmed by camera-ready passerbys. 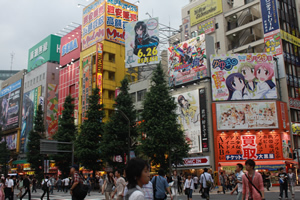 This weekend I visited Akihabara with some of my Japanese friends. We played arcade games and sang karaoke. I really enjoyed the energetic atmosphere, games, and colorful billboard displays. Research Update: We switched our set-up to using a stage to move the sample instead of mounting on the cryostat. The set-up is as follows: sample on stage, wires from pins to switch box, switch box to basic current amplifier, to multimeter. We tried to use a lock in amplifier prior to sending the signal to the multimeter, however we have not been able to get anything but noise from it. Both Kuga-san and professor Kawano have taken a look at this. They suggested not using the lock-in amplifier, and taking the data as we have been (without lock-in amp and signal sent straight to the multimeter). The beauty of the lock-in amp is direct photovoltage measurement capabilities, measuring A-B on contacts, where as currently we measure the photocurrent. We still have not been able to reproduce optical results, not enough time has been dedicated to it. Professor Kawano asked me to try to reproduce the wavelength dependence I-Vs we saw using the cryostat before trying to reproduce optical results. We will use a real red laser, with more power than our 523nm laser pointer. We tried to align with the stage to get the max signal with a basic photocurrent program, using THz frequencies. However, there is really no detectable signal to do so. We just align by eye with beam direct on sample. My lab secretary, Hashimoto-san has been an enormous asset to me during my stay in Japan. Not only has she helped me transition with housing, organizing language lessons, etc., she has tried to give me opportunities to experience Japanese culture. Hashimoto-san’s family is experienced in Japanese tea ceremony; her mother is a professor of the art. She invited me to her house for a lesson. I think this experience was my biggest cultural “accomplishment” so far in Japan. Though it wasn’t necessarily a personal accomplishment, this experience was challenging, thought provoking, and surprisingly sitting down can be physically exhausting. Upon arriving, we walked down to a basement where there was a very traditional Japanese room and sitting area. Hashimoto-san, her mother, 9 year old son, and two students waited for me in beautiful yukata. The sitting area had a small rock garden and a chozubachi to purify oneself before the tea ceremony. Her son guided me, “Left hand, right hand, upward to rinse the handle.” We then proceeded to the room, stopping before entering, sitting, putting a fan in front of us and bowing to the room, in an effort to say, “I will enter.” Then by moving the fan forward, we entered the room, followed it by sliding across the tatami mat floor. Stepping over the tatami lining, we made our way to the front where a banner was placed with June flowers. Hashimoto-san explained to me, “My mother placed this banner for your visit. It is difficult to translate, but means ‘this is a special day, no other day will be like it,’ please enjoy this banner”. We bowed to give our thanks for the banner and took our seats across from the tea preparation area, left of the sensei. We put our fans in front of us, to demonstrate a separation and respect to the tea maker and preparation area. Her son, excited by my visit, whose hobby is studying English, quickly volunteered to serve me tea. He exited the room, re-entering with an apron and bright orange handkerchief, performing the same routine, but carrying a small bowl, a towel, a type of whisk, a bamboo spoon, and a few other supplies. He sat down in front of a tea making area that included: a iron water bowl, and a small wooden shelf with one item per level. He placed his supplies in a row, the bowl to the left of him. He turned towards us, bowing once to the sensei, then to the rest of us. He served us okashi, which, as I learned, one places on a napkin taken from his/her yukata, then serves one’s neighbor. He returned to the tea area, first pulled the bright orange handkerchief from his apron, folding it in a very complicated manner, and then drawing his finger over it writing, as they described: the Kanji for number one. He proceeded to wipe each utensil in a methodical manner, with specific directions of wiping. He cleaned the bowl, turning it three times, then rotating it opposite two times. There are many, many preparation steps, which I will not go into for the sake of your time. In fact, I probably already made a mistake in describing the ceremony. He prepared the tea and beating it with his whisk to create tiny, delicate bubbles. Because I was the only new guest, he presented it to me first. I bowed to him, and then bowed to the sensei to excuse myself for taking tea first. I learned that you must rotate the cup twice towards oneself, drinking the tea in three sips, no more, no less. The last sip must finish with a strong sound to indicate enjoyment and termination. The cup is turned twice counter-clockwise and returned across the tatami line. Her son finished the ceremony similar to the preparation, cleaning utensils and ordering the tea area. He finally bowed to everyone, thanking us, then exited the room, left foot first, bowing again as he left. The ceremony had ended. 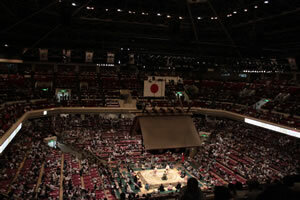 At this point, I realized my legs were like jelly from sitting on the tatami mats and I couldn’t stand up. Everyone had a good laugh as I sat hopelessly stranded on the floor. 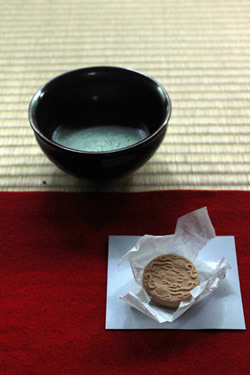 After learning how to correctly receive at a Japanese tea ceremony, I also learned how to perform it. One of the female students performed it with me, letting me mimic her. There are so many ritualistic steps that I can’t begin to describe all of them. Each step has so much meaning and thought. I never realized the true depth each action possesses and its implications of respect on the tea ceremony guests. The whole process of receiving and making tea lasted nearly three hours. This experience was truly amazing and I am so grateful to Hashimoto-san, her friends, and family for welcomingly exposing me to this beautiful tradition. I have such a newfound respect for Japanese tea ceremony as well as for the physical and mental restraint required to sit on tatami…. My Japanese language skills are still very, very beginner. However, I can now understand a lot more spoken Japanese than I would have expected two months ago. I wake up early to study Japanese, generally one hour in my textbook, and try to learn five Kanji daily. At night, as I prepare dinner, I memorize vocabulary. I also read my textbook after/during I eating dinner, for a total of about two hours. I also attend private lessons on Monday mornings for two hours, as well as group lessons on Friday mornings for two hours as well. Some times I am surprised by how much I have learned. I watched Japanese horror movies with friends one night and realized I could understand the plot fairly well, at some points completely keep up with conversation. Today I took a new route to work and found myself completely lost. I looked at some signs and found my way back on track towards my university. I then realized I had read the kanji without even realizing it. I am personally proud of my growth in Japanese, however I know there is still so much work to be done. I hope to continue my study at my university this fall. Although this photo was taken from my trip to Kyoto, it reminds me of learning Japanese tea ceremony this weekend with my lab secretary and her family. It was a truly rewarding and enriching experience. There were plenty of setbacks over the last week. Usually, the supplies limit us. For example, we have a very inconvenient stage, very small range of motion and restricted to only the sample. We cannot measure beam size because we do not have a translation stage that we can mount the power meter on, also it appears there are no razor blades. LabView is in Japanese and an 8.2 version, which makes it very difficult to debug. Also 8.2 it is a bit different from 2011 or 2012 (which I have on my computer in English) so sometimes there is no direct correlation between commands or buttons. This took a considerable amount of time at first, especially when working in instrument drivers that couldn’t be found online. However, over time I have become a lot efficient with this Japanese software. For the most part, the simple program for multimeter is working. For the lock-in, I plan on just feeding its output to the multimeter, which allows the same program to read data from both instruments. However, when we do this, we get zero across the graph, even for taking I-V’s. When we use just the multimeter, no lock-in we can get an I-V curve. We talked to Kuga-san and Kawano-sensei, who didn’t understand why and suggested I only use the multimeter. Mid-Program Meeting Overview: The Mid-Program Meeting was really enjoyable and I feel so refreshed coming back from it. It was amazing talking to Dani-sensei and hearing his take on his work, philosophy, general research, etc. When he spoke to us, I became a bit inspired and driven to work harder and with more interest. The whole environment and philosophy at OIST is very conducive to academic work. Being together as a group was very exciting. I never realized how much of a connection I made with everyone until this weekend. I loved hearing about their experiences, research setbacks, and language struggles, as we all have this in common. The whole experience put a new twist on my current life in Japan. 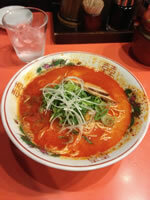 I was beginning to settle down into a routine in Tokyo, unfortunately and frankly a bit monotonous routine. The Mid-Program Meeting was refreshing and reminded me just how big, interdisciplinary and rewarding this program really is. I think holding the meeting at OIST was a fantastic idea. Although this is “NanoJapan”, being able to interact with foreign researchers just like us was rewarding. I felt a connection to them seeing their growth, passion, and excitement to working in Japan. Japanese Language: It is so difficult to rank my speaking skills, especially as I am still a beginning student. However, I think I am encroaching on the JLPT N4 level if I were to take a guess. My goal by the end of the summer is to be near the JLPT N3 level and completing the N4. I don’t use a lot of Japanese in the lab, a lot my labmates are not too supportive of it, simply because my level is so difficult to communicate with. If I try to speak my broken Japanese, many times they laugh (in a friendly manner of course) and respond in English, as it’s more convenient. I think they don’t expect me to be actively trying to speak their language, so it’s difficult for them to judge if they should continue speaking in English or Japanese. I often find self-study or attending extra language classes/conversation workshops to be more helpful than interacting with lab members in Japanese. I purchased the Genki textbook series and absolutely love it. Many of my questions, about when to use a phrase/verb and the appropriateness are included in the text. I usually do not have much time, but I like to start my morning reading Genki, while eating meals, and before I go to bed. I have also printed off the Japanese Language Proficiency Test N4 and N5 Kanji lists (1st grade, elementary school level). I have taped these lists just about everywhere in my dorm room. I have a page in my kitchen, another on my bulletin board, my desk, and finally even next to my mirror so I can study while I brush my teeth! Even if I’m in a time crunch, it’s impossible to not learn basic Kanji every day. Also besides individual study, my lab secretary has been kind enough to ask her collogues to individually tutor me in Japanese. I have been attending individual weekly lessons on Monday. I use this time to ask questions I have encountered in my Genki book, learn some verb conjugation techniques, and practice my speech. I also attend language classes on Fridays at my host university. Volunteers for about two hours teach each lesson. The lessons are unbelievably helpful as they are basically one-on-one conversation workshops. 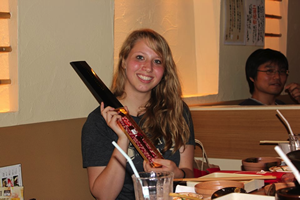 This experience has undeniably impacted my desire to pursue further Japanese language study. I have already emailed some Japanese professors at my university about joining their classes and perhaps placing out of a beginning Japanese course. They sent me curriculum and Kanji requirements to be up to speed with other students. I am heavily considering making Japanese my minor. Cultural Reflection: Because I live in a women’s dormitory, there are some rules about notifying staff when you choose to leave/return. Checking in and out of my dormitory is always a challenging linguistic experience. If I plan on returning after 11 p.m., I have to apply at the front desk indicating where, time duration, and return time. The forms are to be filled out in Japanese, so I just ask the desk attendants to fill them out for me. At my level it is difficult to ask this of them, much less politely. One time I explained to the woman at the desk that I would be going to Kareoke with some friends and may not return until a bit after 11 p.m. She filled out the form and tried to re-iterated, “Please return by 1 A.M. latest,” I told her that I understood, however as I was leaving she called me back to the desk. I was so confused because she started speaking very rapid Japanese and pointing to the clock. I realized she was frustrated and did not confidently think I understood her. She began calling other residents out of their rooms asking “Eigo o hanashimaska?” and bringing the very hesitant girls to me. Total, three girls tried to explain to me the very simple instruction to return by 1 A.M., however I couldn’t insist that I understood. I had no language skills to do so! I was only able to say, “Hai wakarimashta, naruhodo.”Very simple phrases. Naturally the woman was concerned for me with my limited Japanese. My limited vocabulary did not convince her that I understood her instructions. This was a very challenging experience as I had inconvenienced so many people and had no idea how to interrupt the flustered, almost frantic desk attendant, who spoke a whirlwind of stressed words. In the moment, all I could do was insist that I understood. Facial expressions seemed to convey the most in that situation. I maybe didn’t handle the situation well, but I learned about another gap in my language and was reminded that there is more to learning a language than simply syntax. Using a language effectively also relies on human interaction, tone, and expression. 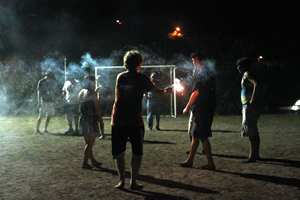 One night in Okinawa, we played soccer and used leftover sparklers from the Fourth of July celebrations. 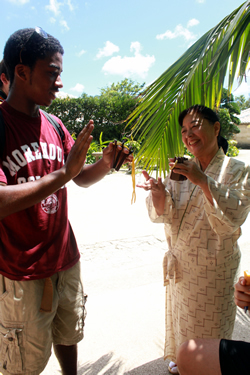 When the group visited Ryukyu Village, Ron bought an Okinawan sanba instrument at a nearby vendor stall. The shop vendor was kind enough to give him a short private lesson! 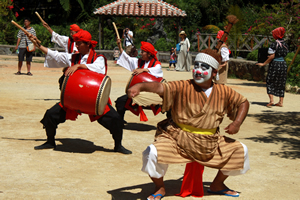 Also at Ryukyu village, a cultural performance was presented to visitors. There were performers dancing and playing drums with the foremost man in white face paint, whistling continuously. It was fantastic! Research Update: We finally got signal in visible and THz!!!!!! We realized that our beam size was far too big, so by reducing it, we finally got some signal! This is exciting and comforting knowing the devices work and that we can more confidently explore the THz with functioning devices. We realized our scale is completely off and have gained more awareness about the instruments. In addition, you pointed out the parabolic mirror is backwards…so we will fixed this and got visible signal in the 2.52Thz, see below. I share the set-up with another student, and it seems he keeps changing the optical alignment, which takes some time to fix. I have asked him not to change it, we shall see. Also, it is difficult to get results at the same location on a sample, if my work runs over into the next day, because in order for the student to use the set-up he must remove my sample. Though, I am working more hours and organizing with him better to minimize this, allowing me to work night and morning consecutive without his experiment changing my optical alignment. Of course, another set-back was the parabolic mirror that you noticed. We changed it and the beam is so much more focused. Thank you! My mentor and I don’t often see each other but when we do, I often leave the situation feeling as if I don’t meet his expectations and a nuisance. Often when I ask for help, he refers me to another. This can be extremely frustrating, though I have always kept an open mind about it. I have considered perhaps mentorship roles in Japan are different, perhaps he felt an obligation by his professor to accept me as a student, priorities may have changed, or maybe just a different communication style etc. Even to this day, as the end of the program approaches, I still have no idea what his impression of me is. I have no idea whether he is simply an indifferent individual or Japanese hierarchy is perceived negatively by me. For example, the last two days measurement has ceased because the cyrostat, located where my set-up is, is being repaired. It broke nearly 3 days ago. The same day our measurement programs suddenly stopped working, mysteriously GPIB communication stopped. We found out today that drivers for GPIB interfacing, for one reason or another, had been uninstalled. Because the computer is in Japanese, it is difficult to search settings or repair software issues alone. I asked my mentor for help. Although it seemed a bit useless to ask, I thought perhaps he will be more willing to help, as I am encroaching on the last week of the program. He should understand the pressure is on, right? He listened to my explanation and shrugged his shoulders, “Wakanai” and began to leave the room. I don’t want to assume he was completely abandoning the situation (perhaps he was going to his computer to search for help on the issue) but I ran after him and asked him to please look at the set-up more carefully. He laughed a bit, coming back into the room, checked the GPIB connectors on our devices, “Yes, all connected,” and began to leave the room again. “Wait! Kuga-san, I think the computer just doesn’t recognize GPIB. Can we check on the computer? I can’t read Japanese.” Just around this time, an M1 student whose work accidently broke the cryostat walked by. My mentor quickly waved him into the room and began speaking in Japanese, surely trying to ask if he changed anything on the computer. After clicking around on the computer searching for programs I suggested to them, he turned towards the M1 student then back to me, “Jaa, this is your assistant for today, ok?” and proceeded to go back to his work. Now, perhaps my mentor assumed the M1 student was the root of the issue because he was the only student in lab that day. Perhaps he believed the M1 student needed to take responsibility for the issues that occurred from his work. Regardless, these scenarios are so typical of my work here in the laboratory. If there is an issue I can’t handle, often it is passed off to a younger student who also doesn’t understand the problem. When I approach his desk to ask a question, his color fades from his face and his facial expression sinks. In these scenarios I assume good intentions and try to be neutral. Obviously there must be an understanding issue, as I am probably misinterpreting his actions. My cultural paradigm has raised me to believe our relationship is strained, but I also know: 1. I think too much and 2. I am unfamiliar with Japanese mentorship roles. I will continue to assume positive intentions and cultural differences. Research Update: We haven’t accomplished anything since the last report because of difficulties in our instruments. The cryostat repairmen have been using the area in which I work from Monday, so measurement had ceased. Set-backs, our GPIB drivers were “uninstalled from the computer” and it took us the day to fix, as multiple versions were incompatible with our LabView version. Though we have fixed, so it is not an issue. Why did you decide to study these fields and why research? I currently work in studying Quantum Computing. I am interested in Quantum Physics so I’d like to study it experimentally by making small nanoscale semiconductors. It is very interesting to manipulate spins and electronic behavior. I chose to work as an academic researcher rather than a company because in a company, it is difficult to study Quantum Computing. Its applications are too futuristic for immediate applications, maybe in 10 years or so such research in companies will be more common. As an elementary school student, I wanted to be an earthquake researcher. I knew in middle school I had a passion for physics and my dream persisted. In high school I first discovered quantum physics and gained more knowledge on it in university. At this point I found myself drawn to quantum computing. I had changed my path from wishing to be an earthquake researcher in this way. How is research funded in the US and Japan? In Japan there is a pool of money dedicated to academic research. The pool of money is divided into catagories so that fixed amounts can be distributed to scientific fields. Researchers write applications for grants, taking money from their subject’s specific money pool. In Japan, most money is dedicated to biology and health studies as well as energy harvest engineering. The amount of money dedicated to physics and electronics engineering is steadily decreasing in Japan. I think this contrasts the current state in the United States as physics and electronics work’s funding is increasing. Though from what I know, the grant process in Japan seems consistant with the United States’. How do you think that a lab in Japan differs from the US? I think the relationship dynamic between professor and students is very different in the United States than in Japan. So in Japan, a professor is hierarchically much higher ranked with his students below him. Whereas in the United States, I have the impression, the professor is equal to his students. I also believe Japanese work hours is different than the American schedule. For example, American hours from 9 AM to 5 PM are fairly finite while Japanese will work from 9 AM to 9 or 10 PM at night. Though this is just my impression. I spent three months in Cambridge twice (two different years, three months each) as part of a research collaboration. They are partners of mine in my work. I have also attended a number of international conferences and visits many universities abroad, for example in the United States and Holland. How many international researchers work in your lab? Particularly in my group, in my past five years in this laboratory, I have had four or five international researching students. In the Oda-Kawano laboratory as a whole since my time here, there has been about twenty international researching students. How has the internationalization of research impacted your work? This is a difficult question. I am collaborating with a Hitachi group in Cambridge. So, in research we are able to discuss between each other with international ideas. Some times they are able to provide good ideas to improve our research efforts. Perhaps, internationalization of research is good as maybe some countries may have particularly strong fields or abundant funding in a specific area. This can benefit a collaborator in a different country. Though I also feel domestic collaborations can be just as fruitful in generating innovative ideas. Why do most Japanese students go to work for a company rather than gain a PhD? I feel perhaps they believe being a professor or holding an academic position is not enough for them. Ten years ago, a lot of post doctoral researchers had difficulty getting jobs. Many young students observed this and were advised to not get a PhD. Maybe this social issue in job difficulty has already subsided, but the fear still exists. Also Japanese culture is very interested in age differences. In Japan, a company worker stays in the company until retirement. It is more profitable for a company to get a younger worker rather than older because they provide several more years of work to the company. PhD holders are generally older than younger Masters students by about three years. This age difference is important to Japanese companies socially for some reason. 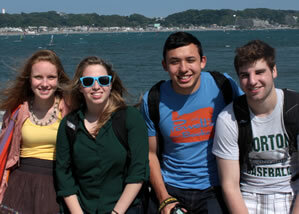 JJ, Lila, Jordan, and Ray together during our visit in Atami, figuring out their next plan for our final week in Japan. 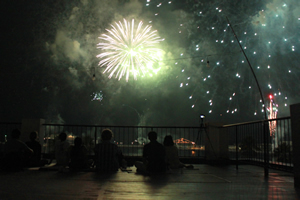 NanoJapan students watching fireworks together in Atami for the weekend. This experience has been eye opening and has given me a new level of confidence in approaching unfamiliar situations. I came to Japan very excited to see the culture and with an open mind. Near the middle of this experience, a little after I first arrived at the Kawano group, I had a lot of mixed emotions. I was very excited to do research in an international group and in Japan, however I couldn’t help but feel like an outsider. I didn’t quite expect myself to be as emotionally affected as I was. However, because of these emotions I was able to gain further insight through being reflective of these “outsider moments”. I now understand that moments I once beat myself up about for being socially awkward, were simply inconsistencies between our language and culture. I no longer feel uncomfortable in these situations, and actually enjoy them. It reminds me of the small, but significant sliver of understanding I have gained by simple experience. Walking away from this program, after living independently in Japan, I feel I can take on anything life throws at me. I sincerely would feel comfortable visiting another country knowing little to none of the language by myself. I never have felt so independent. My perceptions towards my own country have even changed a bit. I’ve learned to really appreciate the Japanese courtesy in mannerisms and speech. In just Skyping my friends back home, the United States’ bluntness seems offsetting and rude. Also, I have grown to appreciate other aspects of my country more. As a foreign woman in Japan, many men I encountered were very conscious of our interactions. They were cautious in their speech, shy, and just careful in their mannerisms. In my laboratory at times, my skills were sometimes underestimated as well. For example, one week I needed to construct a switch box to apply voltage to the sample. This is a straightforward task requiring a few wires to be soldered to certain pins. At most it would take me fifteen minutes. I came in one morning to complete the task, and saw the device sitting neatly completed on the lab bench. My mentor had already done it, unaware that I knew how to solder. Perhaps it was due to preconceptions of my age (due to hierarchy) or gender, I am not 100 percent sure. In my previous research experiences in the United States, my mentors assumed I knew how to do a task or expected me to figure it out. In this way, the Japanese seemed to underestimate my capabilities. Though at the same time and on a positive note, my mentor was being very hospitable and conscious of my work. Interactions between different cultures are very complex, and it’s important to consider positive, negative, and neutral connotations in analyzing them. The aspect I will miss most about Japan is the conscientious and team-effort ethics of working in a lab. Feeling a part of a whole in a work environment was an enriching experience. Impromptu bowling and baseball games don’t happen quite as often in America, if ever. The great balance between light-hearted moments and driven work ethic were both inspiring to me and kept me excited to work. Seeing how lab members play pranks on each other, joke, and help each other out, there is a huge underlying respect. Seeing how close and brotherly my fellow lab mates were while keeping a professional, productive relationship is definitely unique. I really enjoyed getting to know these individuals. My career goals have not really changed. I am still fascinated by physics and technology and still would love to attend graduate school. However, this experience has ignited a much greater appreciation for research. It’s amazing to see just how much you can accomplish in a team. Even if advancements are small, it’s truly rewarding because the progress is made completely from scratch. For my final week I’ve arranged to show the lab how much I appreciated their hospitality. I got a few small gifts for the lab, professors, and secretaries. For the lab I put out a general thank you card and a box of chocolates they could all share. I think they appreciated it. For my mentor Kuga-san and Fujimura-san I wrote them specific thank you cards and gave them each their own small gift. However, I noticed with the professors and secretaries they were hesitant on accepting anything from me. One of my secretaries actually went out during her lunch break, turned around and gave me a gift! I was very surprised why she would say thank you to me. After all, she supported me and all of my needs this summer. I asked one of my Japanese friends about this. Apparently she was inconvenienced by my gift and worried she would appear rude if she did not return the favor. Funny, how on my last day almost three months later, I am still culturally fumbling. My lab also gave me a farewell party. I really appreciated it. They have always been so excited to share a bit of their culture with me through meals. We went to a shabu shabu place in Jiyugoaka. It was really fun! It was great having a chance to sit down with my mentors and professor and talk about non-research related things. It meant a lot that so much of the lab came out for the farewell party. I’m closing out my research experience by making sure I have all the graphs and data to add to my poster. I am also having a meeting with Professor Kawano to discuss final results and make sure we are aligned in our opinions. I also plan on continuing my work through the weekend to get some last polarization results. I didn’t have a lot of time to get these results done, so preliminary rough data will have to do. There is still an issue on power stability, so I will consider the results very rudimentary. I am so fortunate to have participated in this research experience and have learned so much this summer, both academically, culturally, socially. It has truly been a privilege to work with these amazing individuals, scientists and engineers. Research Symposium in Tokyo: I really enjoyed presenting at Professor Tonouchi’s symposium in Tokyo. It was a very rewarding experience because it was a small event with all of our fellow program participants, mentors, professor, and our NanoJapan team. It was a very supportive and casual symposium with a constructive, positive aim to show the progress and work being done in each laboratory. Before the symposium, I understood the professors and laboratories affiliated with NanoJapan are very influential. But I had no idea just how fascinating and innovative their work really is, until seeing their presentations at the symposium. I was blown away by the presentations and the goals of each laboratory. 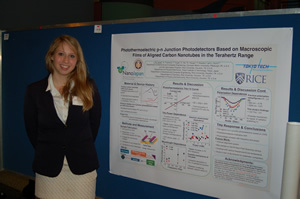 The professors in the audience had varying interests, but were all fascinated by nanotechnology and carbon materials. It was amazing how knowledgeable they were about each other’s projects. Especially as each laboratory focuses on different devices, materials, and methods. I was inspired by their interest in each other’s work and enthusiasm for theirs. It was truly an amazing experience being able to meet and discuss our work with these international scientists and engineers. It was also very interesting to see the relationships between my fellow program participants and their laboratories. Especially, seeing how participants and their Japanese mentors joked with each other through their presentations. The casual nature of the symposium allowed presenters to feel comfortable and excited to present their research. I really appreciated that the student presentations were a mixture of cultural learning and research. It definitely allowed students to show how much this program impacted their outlooks and appreciation for Japanese culture. Re-Entry and RQI Colloquium: Re-entry was a very strange experience for me. I have lived in Houston my entire life and I will always remember how very strange it seemed to me when I returned from Japan. Immediately on the airplane back, the stewardesses seemed very harsh to me and were a bit rude to a Japanese passenger sitting next to me without much English language experience. I was worried for him because if I considered it rude after becoming a bit accustomed to Japanese culture, surely he must have been horrified. The harshness of the American service members seemed to persist as I went through customs. This surprised me and fascinated me at the same time. 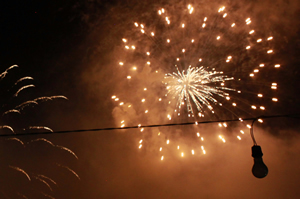 That only three months in a different culture can dramatically alter ones’ social perspective. I remember being on an escalator the first time back, irritated that everyone wasn’t methodically organized to allow for different types of traffic. On the way back from the airport, the Houston highways I had driven on my whole life seemed huge! I was shocked by how large everything was and especially how wasteful it was due to a lack of space efficiency. It took me nearly a month to come to terms with my hometown and regain my old perspective. The Re-entry program put on by NanoJapan was helpful to me in coming to terms with these changes. It felt very supportive having a group of professionals I was familiar with to tell me this culture shock was very normal and expected. It was also helpful in enriching my memories and cultural take-aways by being able to talk with my peers about their experiences. Through their anecdotes, I was able to learn from their stories and experience other areas of Japan without even being there. I also liked how we were asked to take tests to show how our mentality has changed from being abroad. I look forward to receiving those results, especially as I feel my outlook has changed significantly from the NanoJapan program. Additionally, presenting at RQI was also very rewarding. It seemed to be organized as any other conference with poster presentation and talks, but more concentrated on physics and nanomaterials. Whereas other conferences I have attended have had presentations across much broader subject areas. I enjoyed this because I was able to relate to and understand a lot more presentations than I have been able to in the past. Additionally, with being back in the USA, I think what I will struggle with the most is finding a way to continue my interest in the research I did this summer while exploring new things. I’m sure as I explore I will find fields I am not interested in at all, while I will always be very interested in my work done during the NanoJapan program. Regardless, I am excited to be back in a familiar culture where I can really identify the cultural differences I have become accustomed to and therefore appreciate my experiences in Japan even more. Follow-on Project: I will plan on completing my project, a materials and nanotechnology fair of sorts, for children in middle school and high school, in the Spring 2014 semester (The Fall 2013 semester has been my busiest and most stressful semester yet). I have been talking with student organizations that do outreach to local schools already. The next step is to reach out to professors across campus that could help me with this event. I am thinking of reserving a part of the quad or a ballroom room on campus to set up this event and seeing if engineering mentorship programs on campus can help me get youth participants.